The aliens have landed in Team Fortress 2. Which is to say, today marks the beginning of the game’s month-long Invasion event, in which community content has been curated and expanded by Valve to create a sixites sci-fi spectacular across four new maps, with new weapons and items. The new cinematic, marking the Invasion update’s launch, is of TF2’s usual staggeringly high standard. Worth a watch, if only to see the Demoman growing frustrated with his 3D glasses. The four new maps are as follows: 2fort Invasion, in which the perenially popular map is under siege from extraterrestrial invaders – think ravaged architecture and haunting green lights. Watergate, a beer factory with an east coast industrial aesthetic – the beer apparently proving miraculously handy in combating the invaders. Then there’s Probed, beginning in familiar TF2 agricultural territory and extending up to an alien vessel, complete with probing platform. Lastly, there’s Byre, a half-finished barn with an impressive death-ray thingy casting a shadow over its patchy roof. There are new weapons, too, inluding a lightsaber bat for the scout, a laser sniper rifle called the Shooting Star, a C.A.P.P.E.R. raygun, and a Giger Counter. 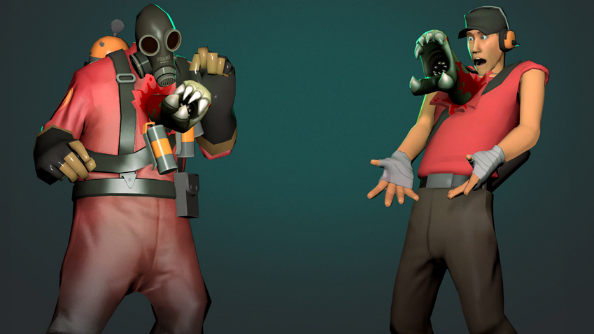 There’s a whole truckload of new cosmetic items too, because what would TF2 be without hats? My personal pick is Chester (pictured above). These items are all obtainable via Invasion crates, which you’ll need an Invasion Community Update key to unlock. A share of the sales of these keys will go to Valve. The event runs until 5 November, and to participate you’ll need to get an Invasion Community Update Pass from the Mann Co. Store and activate the included Invasion Community Update Coin. Full details over on the official TF2 site. Valve have been teasing the alien invasion for a while now, so today offers vindication for anyone who spent the last month wearing a tinfoil cap in retalliation to UFO sightings above 2fort.